So far the only food I’ve been “craving” is Brazilian Cheese Bread. I was first introduced to this deliciousness at a Brazilian restaurant. They brought a little tray of fluffy, light, breaded goodness, that I WAS ALLOWED TO HAVE! 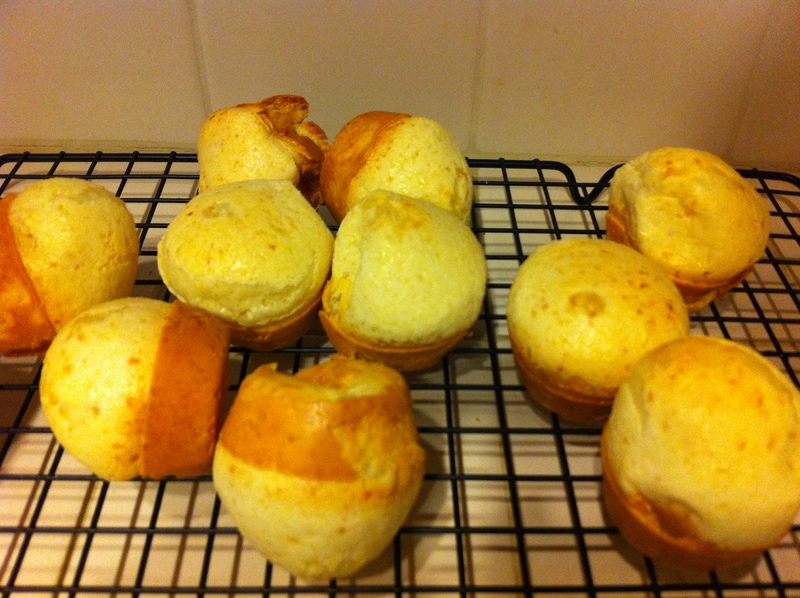 Instead of wheat flour, it was made with tapioca flour. Then my husband discovered a Brazilian cafe a few miles away, so whenever the opportunity presents itself, off we go to get me some Brazilian cheese bread. Preheat oven to 400 degrees. Put all ingredients in blender, blend. Generously grease muffin pan and pour in batter. 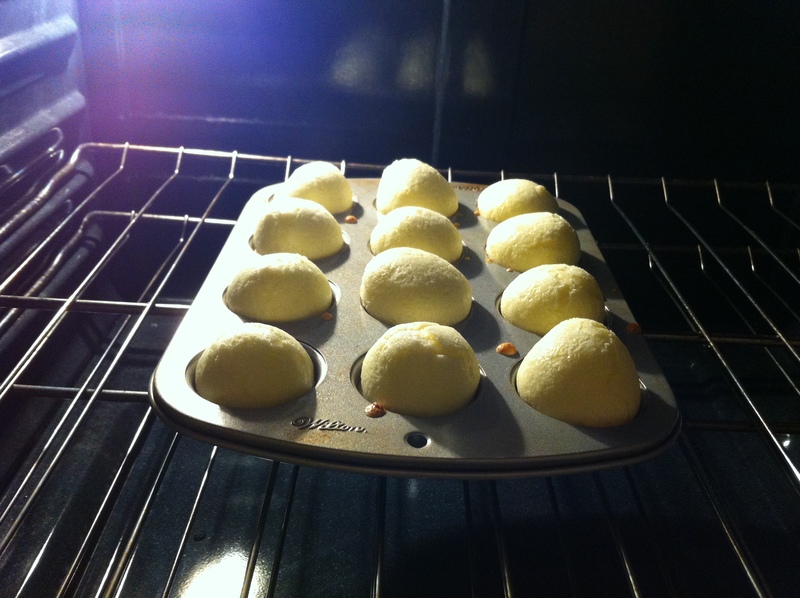 Bake 15-20 mins. The final product. I cannot explain how tasty this is: it’s cheesy, light, and the perfect amount of parmesan flavor. 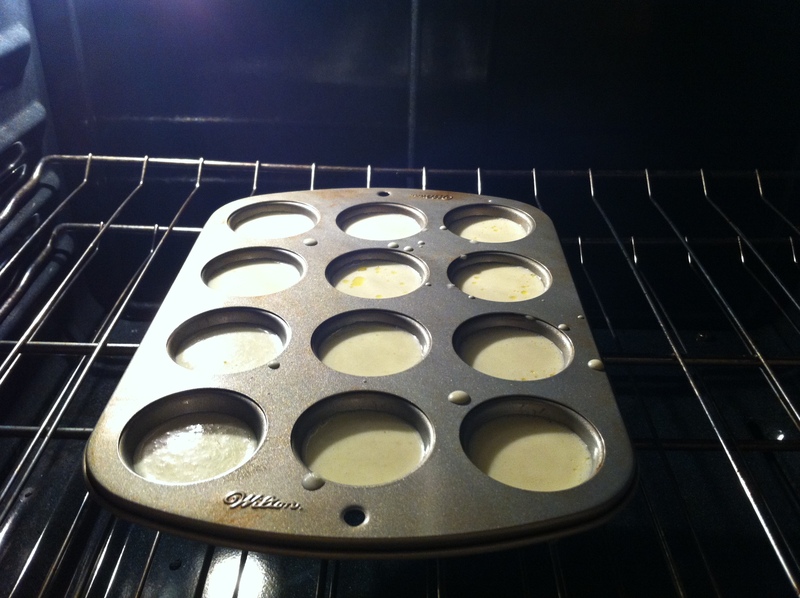 The amount of batter I had was enough for at least 2 batches of mini cupcake forms. Mentality and everyday things change, perspectives are different, start to think ahead about how I would handle certain situations. First trimester is tough: feeling nauseous, extreme food aversions, ridiculously tired. All of this without really telling anybody until I’m in the “safe zone”. I could not drink coffee, at all. My addiction just miraculously ended, only to return during the second trimester, but only for small amounts. Anything coconut makes me gag, which is sad because I need to use coconut oil for my hair every few days… What a nightmare at nights when I use it. My sense of smell is super strong even now, at 20 weeks. During the 1st trimester I took it easy with subbing, slept A LOT, and didn’t do any exercise at all. Walking around the house was almost too much to handle. First trimester weight gain, hmm about zero. During the 2nd trimester, my energy returned, I began exercising. I do some Jullian Michaels videos and go walking in the park and do lots of squats. Total weight gain so far: hm about 5 lbs. Belly is finally slightly visible. Food-wise: I am not sure what it means to really crave something so much that you just need to wake up in the middle of the night for it. I “craved” Hagen Dazs vanilla ice cream bars with chocolate and almonds, but when I would eat one, I would get nauseous for a few hours. So that quickly got eliminated. I craved something greater, like pursuing music again. So got an electronic upright piano which I am practicing on almost daily. Something I also really enjoy is Brazilian cheese bread, so whenever I have a chance to drive by their cafe, I stop by and get some. Perhaps that is a craving? Immune system is totally weakened. I got sick with a cold: coughing, sneezing, congestion, etc. It took me about 2 weeks to get over it. I was nervous and thought I might have bronchitis (judging from the amount of coughing that was taking place) and so I called the nurse who told me to take some Robitussin. Didn’t help, and what finally helped was a few home remedies. The first was brewing a large cup of herbal tea and breathing in the steam through the nose and mouth. The second one was a lot messier (and stinky! ): put organic honey on heated up cabbage leaves, place on chest/throat area, cover up with a towel, wear a tight shirt on top to hold it all in place, and go to sleep. Very unpleasant way to sleep but the results were amazing! People want to give you all sorts of advice. Some of it directly contradicts what I’ve been reading, so I’ve been learning to accept it “graciously” and being thankful for the “help” I’m getting. Vitamins: I take prenatal gummy vitamins because I don’t like how the other ones taste. The gummy ones don’t have any iron, so I make sure to eat meat during the week. Apparently it works wonders, because my blood test showed high levels of iron (which apparently most women have low amounts of especially during pregnancy). I’ve spoken to a few people about it and they say they had prenatal vitamins with iron, and ate lots of cereal (which is fortified with iron) yet their levels were still low. This made me question the whole concept of how meals are influenced by the culture. Absorption of iron is best when taken with Vitamin C. Calcium inhibits iron absorption. Yet here most people are encouraged to eat low fat milk with whole grain cereal. The calcium in the milk inhibits the iron that’s in the cereal and no benefit at all is taken from that meal. This confirms how my iron levels were high: most of the meat I eat is with veggies, which is full of Vitamin C, so it helps absorb the iron. And also, I cannot prove this, but read somewhere that grains inhibit absorption of most vitamins as well, so it’s almost like we aren’t even supposed to be eating grains with anything, except maybe by themselves? Go figure. I don’t care to make a conclusion on that just yet. Vitamin D: super low levels. My prenatal vitamin provided 100% (400 IU). Doc told me to start taking 5000 IU per day! I went and bought some that same day and then proceeded to research about Vitamin D deficiencies, especially during pregnancy, etc. The shocking information I found was that women who were deficient in Vitamin D had a much higher risk of having babies born with autism or muscular dystrophy (and a few other conditions, but that’s what I remembered). Something about the fact Vitamin D helps the immune system and with making other vitamins “work”. Best way to get Vitamin D is through exposure to sunlight. After more research, I was able to determine that the benefits of sunlight far outweigh any risks associated with sunlight exposure. And last but not least, another one of my conclusions: being gluten-free for a while is what helped me with conception, otherwise I don’t know how much longer I would have had to try or give up. My sensitivity seems to have increased during pregnancy: before I was able to consume very small amounts (example: 1 tsp soy sauce, or chocolate containing wheat [not the crisp or crunch, but inside chocolate itself]) but not so now. I ate a few bites of chocolate which had wheat, and was fine for a few hours. And then the itching on my stomach and back began, and it was just so intense! The “scabs” occurred because of that itching and took over a week to only begin fading. I need to come up with another way of avoiding potential glutenous items at people’s houses. Most of our friends are aware of my condition and serve options I can eat, but not everyone knows to what extend most food has wheat as an ingredient. I am working on thinking up some “diet” where I don’t eat after 6, or whatever a particular circumstance may require. Eh. Well this was a long post! I think I covered most of what I was trying to say.